The Prism Sound ADA-8XR Audio Interface with 16-Channel A/D & 8-Channel AES I/O is a 24-bit / 192 kHz modular audio interface offering flexible inputs and outputs, versatile clocking, and configurable routing, for demanding music and film production scenarios. It includes three I/O modules and a utility module for 16 balanced analog line-level inputs via XLR 3-pin jacks, eight channels of AES3 digital in and out via a transformer-coupled DB25 connector, a 1/4" stereo headphone output, and more. A 4.9' DB25 to XLR breakout cable is supplied for simplified hookup of AES-capable equipment. With selectable input limiters, adjustable levels and low distortion and noise, it delivers high-quality audio performance that is easily customized using the onboard display and comprehensive controls. The Prism Sound 8C-AD is an 8-channel A/D module offering uncompromising analog-to-digital conversion for producers, musicians, and audio engineers using a Prism Sound Dream ADA-8XR audio interface in a variety of studio environments. Exhibiting low noise, minimal distortion, and high dynamic range, it features eight balanced XLR 3-pin female inputs, which accept line-level signals and feed them to 24-bit/192 kHz A/D converters. Input level and trim are adjustable per channel for precise calibration and gain optimization. Prism Sound's Overkiller limiters are individually selectable for each of the eight inputs, allowing protection against clipping on a channel-by-channel basis. 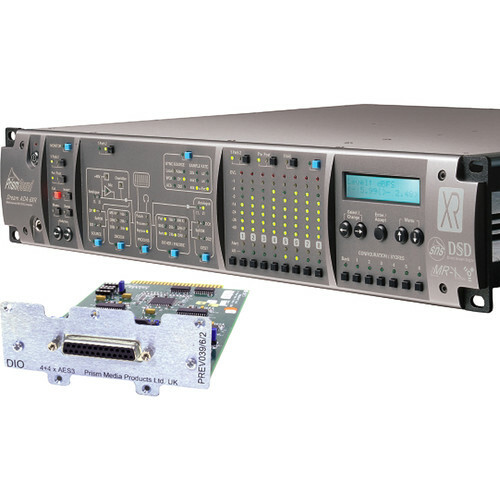 The 8C-AD easily installs into an analog I/O slot of a Dream ADA-8XR (available separately). The Prism Sound 8C-AES is an 8-channel AES I/O module offering flexible digital input and output configurations for producers, musicians, and audio engineers using a Prism Sound Dream ADA-8XR audio interface in a variety of studio environments. It supports resolutions up to 24-bit / 192 kHz, AES3 and S/PDIF channel status, and one- and two-wire modes. One transformer-coupled DB25 connector accommodates eight channels in and out and can be wired to XLR-equipped gear via the supplied 4.9' DB25 to XLR breakout cable. The input and output sections are independent, which allows them to operate at different sample rates, sync to different clock sources, and utilize different impedances. The 8C-AES easily installs into the upper or lower digital I/O slot of a Dream ADA-8XR (available separately).